In contrast to that wet stuff of the previous weekend, it’s all sunshine this weekend. Seems like everywhere I go I’m seeing Iris and Daffodil flowers up. As if it weren’t otherwise obvious, Spring’s coming. In a quest to get ever farther away from traffic, so far this year several of the rides have been way, way up north and far from the maddening crowds. Liberty Hill and Bertram continue to be one of my favorite places to ride. Unfortunately I have to drive a ways to get there and come home which seems ironic considering the point is to ride my bicycle. The ‘commute’ + the ride makes a ride of any distance take a fair chunk of the day. 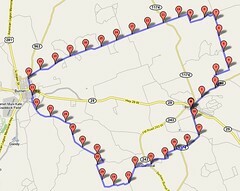 Ok, so the ride was a loop ride from Bertram to Burnet and then back. See map. All familiar roads that I’ve been on at one time or another, but just never in this configuration. As it turns out, I’ll probably do this route again and again. I really liked it for the combination of low traffic, mileage (not too long at 40 miles but just long enough) and the fact that it has a nice break point to refuel in Burnet – in the 20’ish mile range. 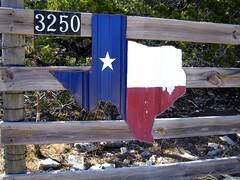 The picture of the state of Texas done up as the Texas state flag in corrugated metal caught my eye as I rode along at some point south of Burnet. The picture of the guys was done by Kem on a ride out in the same area a few weeks ago. 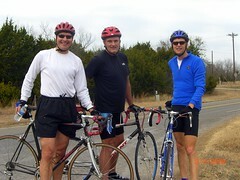 That’s Austin, a friend of Jim’s (center), and me in blue of course. This weekend Kem’s out tailing the Tour of California with her cousin and his wife.